Robert Hellenga was educated at the University of Michigan and Princeton University. He is a professor at Knox College in Galesburg, Illinois, and the author of the novels The Sixteen Pleasures, The Fall of a Sparrow, Blues Lessons, Philosophy Made Simple, and The Italian Lover. As soon as she steps out of prison, Sunny declares, “I used to be Willa Fern. Now I’m Sunny.” (35) What does this new name mean to Sunny? How does her outlook on life change in this moment? Consider how Sunny and Jackson tell their own stories. How do the chapters in Sunny’s voice differ from the chapters told from Jackson’s point of view? Discuss what snakes mean to each character in the novel. Why do Earl, DX, and the followers of their church handle snakes? Why are Cramer and Sunny studying them? Why is Jackson drawn to DX’s two-headed snake? What personal, spiritual, and professional possibilities do snakes hold for each of these characters? As Sunny decides to live in Jackson’s home, she tells him, “I don’t need anyone to look after me. But maybe you need someone to look after you.” (63) Throughout Sunny and Jackson’s relationship, who seems to look after whom? When does the balance of power shift between them and why? How does Claire, Jackson’s ex-girlfriend and occasional lover, change over the course of the novel? Does Claire seem like a trustworthy character when we first meet her? What about at the end of the novel, during and after Sunny’s trial? How does she eventually earn Sunny’s trust and sisterly love? At the end of her first semester at Thomas Ford University, Sunny says, “I was suddenly overwhelmed with a sense of well-being, a sense that the answers to life’s big questions had fallen into my lap.” (188) What important answers does Sunny learn from each of her classes—French 101, Great Books, English 207, and Biology 120? What big questions still remain unanswered for Sunny? Discuss Earl’s leadership as the pastor of the Church of the Burning Bush with Signs Following. What are Earl’s values? What mistakes does he make when he is “backed up on the Lord,” and how does he repent? Is he a villain in Snakewoman of Little Egypt? Why or why not? “For Jackson the Church of the Burning Bush with Signs Following provided a professional opportunity too good to be passed up.” (140). Why is Jackson uniquely qualified for this assignment of “salvage anthropology?” (123) What does Jackson seek in Naqada, and what does he end up finding? Does his research take him closer to the spirituality of the church or further away? Twice Sunny stands trial for shooting Earl. How are the circumstances of each shooting similar, and how are they different? At her second trial, Sunny realizes, “And the funny thing was, I knew in my heart of hearts that in some ways the prosecutor was closer to the truth than Stella, and he, the prosecutor, didn’t even know the half of it.” (322) What version of Sunny does the prosecutor present to the jury? Why does the jury end up siding with Sunny, even if the prosecutor is closer to the truth of her crimes? During her trial, Sunny realizes, “And in fact in my own inner courtroom I was on trial for going to Mexico with another man.” (314) Why does Sunny choose Mexico over Paris? How does she atone for her decision? Jackson often speaks of looking along a beam of light instead of looking at it. (168) What vision does he seek when he looks along a beam of light? What are the rewards and dangers of this point of view? Warren, Sunny’s uncle, dies before the novel begins, but he has a strong effect on Sunny and Jackson’s lives. What kind of man was Warren, according to Jackson and Sunny’s memories of him? How does Warren manage to help his niece, even after his death? In the end, why does Jackson return to Africa? Does it seem likely that he finds what he’s looking for, even if Sunny never learns of his whereabouts? Why or why not? Robert Hellenga writes that the “two stories . 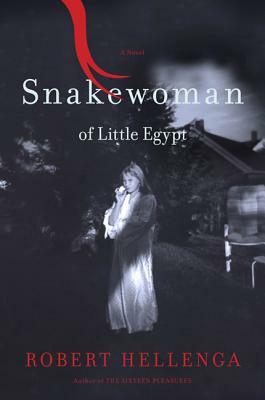 . . are intertwined (like two snakes) in Snakewoman of Little Egypt.” (341) How does the author weave the strands of the novel together? What do the communities of Little Egypt and the Ituri Forest have in common, and how are they different? How does Sunny and Jackson’s love story unite these two worlds, and why does it ultimately drive them apart?